This Thanksgiving, our robot overlords will only feed us if they feel we truly deserve each morsel of our traditional human meals. At least, that’s a grim interpretation of Arm-A-Dine, a semi-autonomous robotic third arm that gamifies Thanksgiving Dinner. The robotic arm will feed whichever human looks happiest about their upcoming treat, reports IEEE Spectrum. After someone manually guides the chest-mounted robot toward a piece of food, it will grab the morsel and hold it in the air. If the person sitting across from the arm looks happy about the prospect of a snack, Arm-A-Dine will deliver it to their mouth. Yummy! 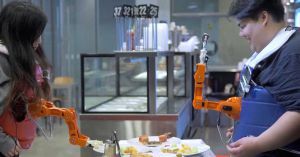 If that person actively frowns, the food will go to the person wearing the robotic arm. If the person seems fairly neutral, Arm-A-Dine will wave the food back and forth before feeding it to a human mouth of the device’s choosing, according to research published by Australian engineers at Melbourne’s RMIT University that will be presented at the human-robot interaction conference SIGCHI this month. Thankfully, IEEE Spectrum mentions, Arm-A-Dine will avoid punching out your teeth by bringing the food about ten centimeters from your face. Just like in “Hitch,” your feederbot will wait as long as it takes for you to come the last ten percent and claim your reward.